Comfort and convenience... Control your home temperature with this Z-wave enabled programmable ADT thermostat. 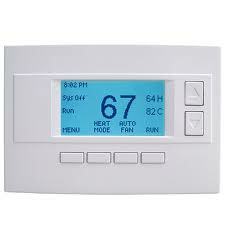 It replaces your existing thermostat and comes in a battery-powered version or a model that can be wired to power. You must have ADT Pulse Level III monitoring service to add thermostat control. Price includes installation. Save energy by having temperature adjust when you arm your security system to away mode... do not spend money when no one is home to enjoy it. The ADT Pulse platform can also have the Nest thermostat integrated with the ADT Pulse App. "Interested in updating your alarm system or getting a new one. Call these guys." I got the works. I got window and door sensors of course, two key pads (second one was an option) I got two outside cameras and an inside camera. I got the new thermostat and even got a new front door lock that has a key pad and one that I can lock and unlock from my iPhone. So I can check if my front door is locked while I am away and I can even lock it remotely! (I am impressed by that). The whole installation price was about 1/3 what I was expecting and the monthly charge is less than some simpler alarm systems. Jeremy, the installer, spent his time first making sure the alarm system was working as it should then he set about programming the "toys" (camera and thermostat and front door). It all works great! I was contacted by Greg and he dropped by to help me program some "events" and "alerts" so I can get notifications and video clips on my iPhone... Anyway, if you are interested in updating your alarm system or getting a new one. Call these guys. They take their time with trying to understand each customer's situation and help them find the right solution." How Does the ADT Pulse Thermostat Compare to the Nest Thermostat?